Join me as I take delivery of some extra special beers that I have just bought from Beermerchants.com. I was overwhelmed with how good the Lost Abbey beers were at Christmas that I was thirsty for more. Of course, the Lost Abbey beers were quick to sell out but the Port Brewing pack is still available - Port Brewing being a sister company to Lost Abbey in California, but specialising in more hoppy IPA style beers. There was also another special pack of rare beers from Struise, Mikkeller and De Molen - some collaborative brews and all hardly ever seen in this coutry apart from the most adventurous of CAMRA beer festivals. Again a short run and the special nature of this offer meant it was quick to sell out but the beers from Mikkeller are still available. Finally, a few beers from Boon Brewery in Belgium, specialising in the famous wild, sour beers generally only available in Belgium. BEERmerchants.com do not only sell beer for beer geeks, that would not be much of a business. Their mainstream offerings are just as interesting. Their mixed packs are good value and an easy way to spread your wings as far as beer drinking is concerned. I can also say that their customer service and delivery service is excellent. I try to take my camera and my small video camera wherever I go these days just in case I come across something interesting to share. I arrived late afternoon at the Willoughby Arms beer festival having been delayed by the other beer festival at the local Wetherspoons. A long afternoon enjoying the range of 30 odd beers quickly turned into evening and the Ewell St Mary Morris Men arrived to dance. Of course, they needed fuel before they could muster the energy required but after a few jugs of foaming ale they got down to do their stuff. As you can see by my short introduction, I think you need to be a bit pissed to enjoy Morris Dancing but for entertainment on St George's Day you cannot beat it. This is eccentric England at its finest. You may remember the story of my family enjoying the ages old tradition of father and son using the same watering hole. Well, it did not last long. The Hare and Hounds closed a couple of months ago to enjoy the current trend of a Young's makeover. Originally the planning application was going to replace the 1930's public bar with a new gents toilet but a robust protest by drinkers to the local authority planning office was successful and Young's had to push ahead with plans for a makeover rather than a full refurbishment. At the time, a huge bill board was posted outside the pub stating "At last". What it means nobody knows. However, ironically work on the pub stopped abruptly before Easter and the local paper published that there was a problem with planning for an upstairs kitchen and Youngs are now waiting until that planning application is agreed so that they can open with a fully operational food offering. 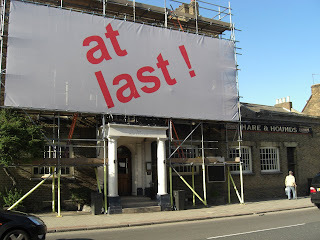 When it does finally reopen, we at least will be able to say "At Last". CAMRA branches in London are presently judging the twelve branch pub of the year to determine the winner for 2009 for the Greater London region. Our national day, and where better to drink a toast to the old dragon slayer than the Willoughby Arms in Kingston which is hosting its annual St George's Day Beer Festival - on now until Saturday. Get there today from 7pm to see the Ewell St Mary Morris Men in action. Downton Chocolate Orange Dark Delight is sadly not on the list so hopefully it will make for a slightly less messy afternoon. Although Fullers Golden Pride appears as a rarity in cask so anything is possible. The Willoughby Arms is Kingston CAMRA branch pub of the year for 2009 - a deserved winner in an area of Kingston that is blessed with good drinking holes. Other events in my locality where I may appear later in the week are The Ailsa Tavern in Twickenham (well, St Margarets really) and The Andover Arms in Hammersmith (well, Ravenscourt Park really) - both hosting small beer festivals from today to Saturday. Drink up and celebrate all things that make this country great. 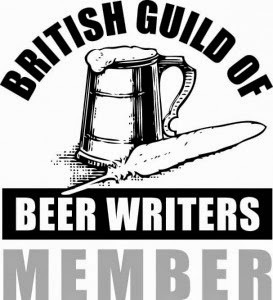 CAMRA branches in London have all decided their best pub for 2009 and each of the twelve branches now provides a judge (or a team of judges) to visit each winning pub. The votes are then cast at the end of June to decide which pub is the Greater London Pub of the Year to go forward to the regional final stages. The winner in London last year was The Trafalgar in South Wimbledon. This was then defeated at the super regional stage by Sussex's best pub, The Royal Oak at Rusper Street which in turn lost out in the final stage to The Kelham Island Tavern, Sheffield, CAMRA's National Pub of the Year for 2008. What makes a great pub is often a matter of personal choice and sometimes the beer led CAMRA criteria give rise to some winners that may not be universally agreed. However, anyone who has ever been to the Kelham Island Tavern could not deny it is a great pub. In the coming week, I intend to elaborate on London's twelve local choices for 2009. The other story from the BHS newsletter is one on beer mats. The Huddersfield Daily Examiner reports that the manufacturing of beer mats is to switch from the Katz Quarmby Group in Huddersfield to Germany. The closure of the Brighouse site after 136 years of operation means the loss of 12 jobs. The firm was founded in 1872 as Quarmby Promotions and began making beer mats in 1932. It was taken over a few years back by the German Katz Group. The firm estimate that over the years they have produced 9.5 billion beer mats ! About six months ago, a family of three hens came to live with us. We went under the wire to rescue them from a battery farm. They live in our garden in a bespoke house that cost an arm and a leg. Within a month, Mrs W had one of them down the vets and a further bill of £120. At that time each egg was costing us about £10 - you can keep your provenance and sustainability. They have quickly become family pets and the dog is less than happy. They have now settled in and are laying well and we have eggs abundant. Boiled, poached, fried, mayonnaised and omeletted, we have had it all and are now egged out. Time for a fresh approach so I googled recipes for the pickled version. Pretty simple recipe : 6 eggs - hard boiled - cooled and shelled. 500ml of cider vinegar boiled up and simmered for 10 minutes with a choice of spices. I used whatever was in the cupboard; chilli flakes, garlic cloves, cardamon, mustard seeds and peppercorns. Allow to cool and pour into a clean airtight jar covering the eggs. Put in fridge for 4-6 weeks and enjoy. I have no idea what they will taste like. I have to admit that they do not look too appetising. I used Aspalls cider vinegar. I have always been impressed with their ciders so their vinegar is hopefully quality too. Apparently a more mellow pickling comes through using cider vinegar rather than the pickling type - it also fits better for a beer blog. I included all of the spices in the jar which will hopefully infuse further during the pickling process. In Sudan a new 180,000hl brewery (c100,000 barrels ?) is to be built in the Christian south of the country by SAB Miller at a cost of $37 million. The last brewery in the country was closed in 1983 under Islamic law. Now Sudan is not a country I know anything about but I guess the country's beer drinkers are celebrating. Typical Bank Holiday Weather ? Not in Margate ! The weather was as good as the beer, a beautiful sunny day. It was warm enough to stand outside on the prom until someone decided it was an elf and safety risk and we were all brought back into the safety of the beer hall. Highlights of the day, apart from the weather, were mainly among the beer. It seems to me that the best micros are getting better and better. The stronger offerings from Dark Star (Ruby Mild 6% and IPA 6.2%) and Thornbridge (St Petersburg Stout 7.7%) were first class even though it meant that the real health and safety risk was my walk back to the station. One other highlight was the bottle shop from Gadd's Brewery. An excellent range of foreign and british beers - including many rarer beers - such as a large range from Mikkeller in Denmark. Alas no formal mail order arrangement but if you are in the Ramsgate/Broadstairs area, it must be worth a look-in. A trip to the seaside is as traditional for a Londoner on a bank holiday as eggs are to Easter. Luckily, for the beer lover, in recent years we have had the Thanet Beer Festival to look forward to in Margate on Easter Friday and Saturday. Once described as "ugly" and "scruffy" by the elegant, Bob Geldof, Margate has indeed seen better days. The beer festival though is held in the Winter Gardens, the town's famous concert hall that has hosted all of the famous variety acts over the last 100 years from Laurel and Hardy to Ken Dodd to Lemar. This week's star turn is over 200 real ales racked up on one long bar - surely the longest in Kent. The side bar overlooks the sea and the usual April weather brings an atmospheric swell to watch from the comfort of the warm bar. The venue is about a mile from the station and an engaging sight is that of a couple of hundred beer festival types (if you know what I mean) pouring off the train and marching in quick step to the festival at a quarter to opening time. "Blimey, where are they all going, Dad" I once heard from a small boy. This is as enjoyable a day at the seaside as you can get. My copy of the JD Wetherspoon plc interim accounts arrived today and, for once, I have taken time to read the Chairman's report. While interest rate swaps and accounts "marked to market" is part of a previous life for me there is something from the report that is worth sharing on this blog. "In the six months ended 25 January 2009, the Company made profit after tax of £17.3 million, yet taxes generated were £190 million (this includes VAT (£79 million); Excise Duty (£53 million); PAYE and National Insurance (£30 million; property taxes (£18 million) and corporation tax (£10 million)." "On an annualised basis, this equates to the Company making £50,000 after-tax profit per pub while generating tax of about £530,000 per pub......"
"...Even the closure of one small pub results in a far greater loss of revenue to the Government than it does to the publican or pub-owner"
Hopefully the Chancellor is taking notice of his reducing tax revenues (not all, of course, from the pub trade) and will do something to relieve the ever increasing burden to give pubs and beer drinkers a fairer chance. Nice story about Axe the Tax's Mr Pinty and his friends here. This is your last reminder that Sambrook's Brewery will be open to the public tomorrow, Saturday from 2pm. This is a chance to welcome Sambrook's to London's brewing scene and to toast its continued success with the new bottle conditioned version of Wandle Ale. If you have not already tried the cask Wandle Ale in any of the pubs or beer festivals where it has already been a big hit, get down to Battersea on Saturday 4th. Anyone who has read the editorial in the latest issue of London Drinker will know that I am now focusing on the weight that I have put on in the years as CAMRA's London director. I took courage this morning and stepped on the scales for the first time in ages. I didn't need the talking scales to tell me I had put weight on but to be told "one at a time, please" was not nice. A hefty 213 pounds, 15 stone 3, 96+ kilograms, the weight of a kilderkin, 18 gallons, a real (half) barrel o' beer. My fighting weight is a good two stones lower, still heavy but not so morbidly obese. Two stones have got to go. Started well with stodgy porridge, this morning. No more cheese, chocolate or biscuits. Beer ? Well one has to keep one's pecker up so beer has to stay as a vital part of any diet. Fluid intake is essential. In any economic downturn there will always be winners and losers. The winners generally are companies that enter the recession in good financial shape and take advantage of weaker competition - seeing the credit crunch as an opportunity rather than as threat. One such company is Fullers. Last week they announced that they had just paid £21.1million for six of central London's best pubs sold by Punch Taverns who have an urgent requirement to raise cash to shore up their balance sheet. One of the pubs is Ye Olde Mitre in Ely Place. The guvnor, Scotty, and his team, famous London-wide for his well run historic pub and his choice of different beers, will stay under the stewardship of Fullers. Guest ales are likely to continue alongside the Fullers range. Seafarers Ale launched – Fuller’s new permanent cask ale, Seafarers Ale, will be available from the first day of Cask Ale Week. For every barrel of the refreshing 3.6% ABV brew sold, Fuller’s will donate £3 to Seafarers UK, the leading maritime charity. Also on April 11, Fuller’s pubs will be participating the an attempt to break the World Record for the World’s Largest Toast. The current record stands at 485,000 people. The toast is "Cask Ale" ! It could be that Farmhouse beers are the latest beer style to get a push. You will have read of the Lost Abbey, Biere de Garde that I enjoyed on my last post. Tomme Arthur, the brewmaster at Lost Abbey, USA is a master at brewing beers in Belgian style and his two bieres de garde style beers that I have tried are both delicious. There is also a two page piece in the latest issue of Beers of the World magazine on Saisons and Bieres de Garde written by Roger Protz. I have only subscribed to this magazine over the last year or so but I think it is much improved and now very readable. 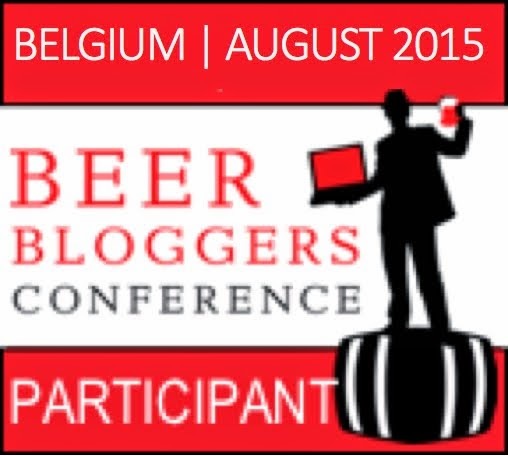 The latest book I am reading is the second in the series on Belgian Beers published by the Brewers Association (USA). Farmhouse Ales, written by Phil Markowski, brewer at Southampton Brew House, New York, covers the Saison and Biere de Garde styles in some detail. Like the one on Wild Brews, it does get a bit wordy and geeky at times though the books are aimed primarily at home brewers. It is an absolute must for your bookshelf if you have a more that passing interest in Belgian (and French) beers styles and want more than Michael Jackson has previously offered. Finally the latest offering from Dark Star brewery is a Saison. A 4.5% brew, intentionally cloudy, with a classic sweet malty flavour and a characteristic spicy finish. I guess it won't be around for long, so catch it while you can. Like buses all coming together, I feel that my whole knowledge of Farmhouse Beers has come in the last two weeks. Not necessarily the most characteristic or even well known beer styles but enjoyable all the same.